Time flies so fast this year. With all the busy plans and tasks to be completed all year long, I can’t believe it’s already end of October and soon it will be the holiday season. Even when I’m not celebrating the holiday – Halloween, Thanksgiving or Christmas, once it reaches December the mood is there for holiday. So for those preparing for the season, perhaps you would want to customize holiday cards to be sent to friends and family members. Rather than buy the one sold in bulk with the same boring design like last year, maybe this year you would want to share the spirit of the holiday even more. And while you are uploading your template to VistaPrint, make sure you use their coupon code during checkout. For example, by using the coupon code – FreePen07, you can get one free custom promotional pen that you can customize. What you need to pay is the shipping and handling. 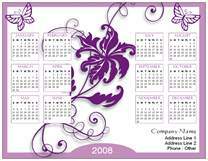 Whereas for coupon code FreeCalendar07, you are entitled for one free custom wall calendar while coupon code- FreeHoliday enables you to get 10 free custom holiday cards. In my case I’m thinking of getting calendars to give to customers and friends. It will be a nice but practical marketing tools for my business. What do you think of this magnetic calendar? Otherwise if the budget would allow, I’ll go for desk calendars or wall calendars. Nice gifts for Christmas and New Year, right?